Portinatx, Ibiza. The small resort of Portinatx offers magnificent panoramic views, crystalline clear water, high, rocky shorelines and three beaches with fine, white sand. Getting there: Reached by car or bus, well signposted. Parking facilities are good. Small ferries connect to and from San Antonio. 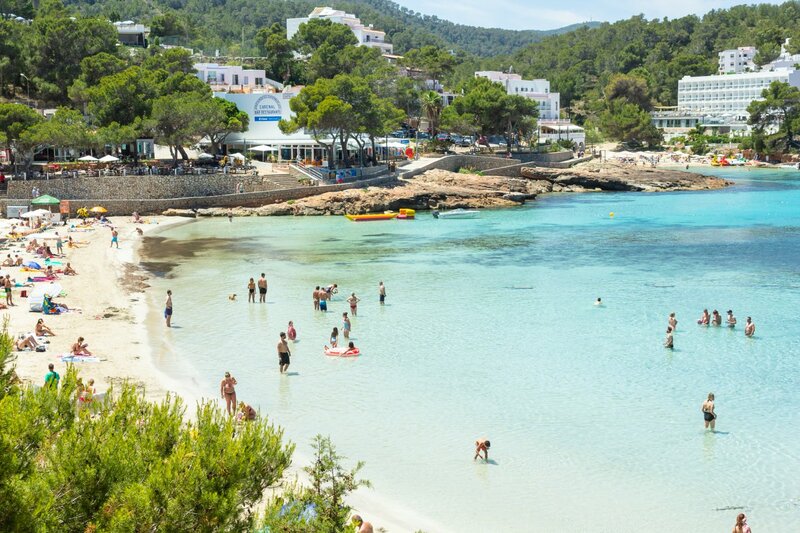 One of Ibiza's best known beauty spots, the little resort Portinatx (spelled Portinatsh) is a popular stop on the Round The Island excursion. The bay offers magnificent panoramic views, crystalline clear water that's great for snorkelling, high, rocky shorelines and a seabed of fine, white sand. There are three good, sandy beaches in this area, all safe for children and offering a variety of activities. The largest is in the bay across from the main coach park, S'Arenal Gros; little S'Arenal Petit, which is more private, is around the corner from the rocky promontory to the left. The third is Playa Porto Beach, surrounded by little pineclad hillocks, it is in a little cove at the end of the main road where you'll also find the lighthouse. There are fantastic scenic walks and spectacular photo opportunities around these beaches, so it's worth taking the time to explore. As the beaches are located a short walking distance from the resort there's a good choice of shops, bars and restaurants close by all three. There's a wide range of family-friendly accommodation in Portinatx, from economically priced apartments to hotels with entertainment and lots of facilities. The landscape in the North of the island is exceptionally beautiful, so renting a holiday villa in this area is something really special. Find out more about the resort of Portinatx.